ZigZag Whitsundays is a fun day tour on a fast comfortable boat. At 38 feet long and 1200 horsepower, this is a day trip like no other. This tour is perfect for guests that want a fast-paced adventure that will not blow the budget. 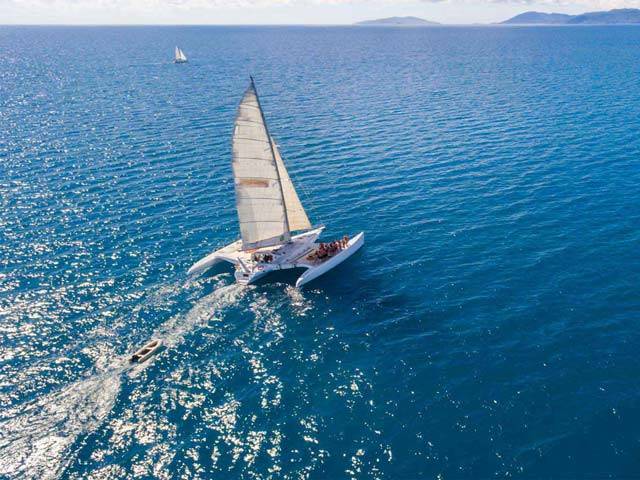 ZigZag is the only boat in the Whitsundays with dynamic pricing, with prices starting at $105 for people who book early, this is the most affordable day tour in the market, This is also the only day trip that visits Palm Bay Resort on Long Island. 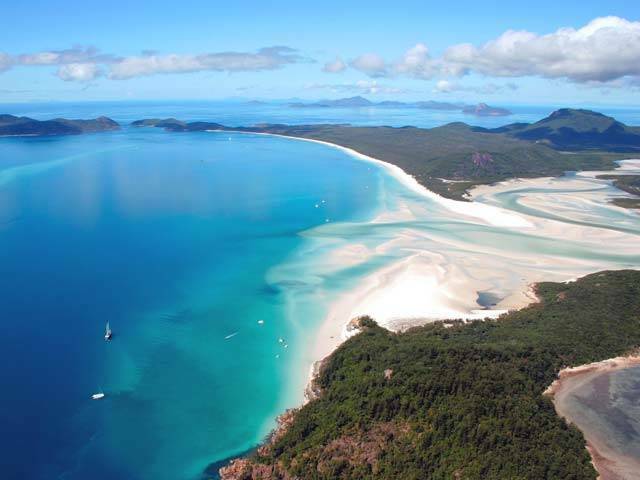 You will also get 2 snorkel locations and 90 minutes on Whitehaven Beach. 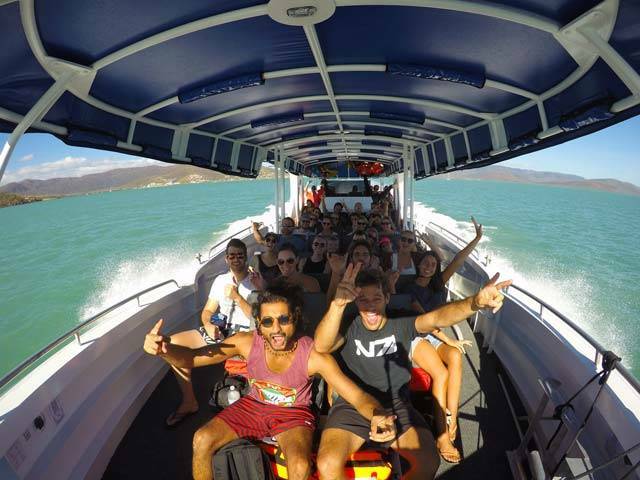 All this in one day makes it the most action-packed Whitsundays tour on the market. ZigZag Whitsundays Tour visits Whitehaven Beach for around 90 minutes. During this time you will have the crew will serve lunch on the beach and after you will have plenty of time to explore and swim. at this breathtaking location. There are games to play on the beach or explore the bush land which has local goanna’s. Take a walk and explore the 98% pure silica sand dunes and take a refreshing dip in the crystal clear waters. During your 1 day tour, you will get 2 opportunities to snorkel the coral-filled bays on the coastal fringes of the islands. Here you can see turtles, Maori wrasse, batfish, parrot fish, clown fish (Nemo) plus plenty more! in most bays, the coral starts close to shore and is easily accessible by the front stairs on the boat. For the nonconfident swimmers, there are noodles and flotation devices available for safety. If you are walking – (15 min walk time) you need to be at Abell Point Marina Roundabout (North End Meeting Point under the Umbrellas see map above) @ 8.00am . ZigZag does not have set itineraries, as we are dependent on weather & tidal conditions. When you board the boat, the crew will sit down with you and go through information specific to the vessel as well as where you may be going that day. ZigZag is an open vessel you can get wet whilst we are travelling, please be prepared for this. waterproof cameras (or waterproof protected cameras) rather than expensive digital cameras. Your electrical equipment will be ruined if it comes in contact with seawater. may find it slightly uncomfortable, Please be prepared for this. B&N Operations Pty Ltd ABN 14 617 437 751 t/as ZigZag Whitsundays operates the vessels known as ZigZag, The following terms and conditions apply to travel by you on ZigZag . All ZigZag departures and itineraries are subject to weather and may be changed or cancelled a B&N Operations discretion. ZigZag reserves the right to substitute vessels without notice at any time and for any reason. ZigZag reserves the right to cancel any trip, or reduce trip duration, in any circumstances, including those which pose a safety risk to you, the vessel or crew, such as severe weather, including cyclones. If ZigZag is cancelled by the owner prior to or on the scheduled departure date, you will be refunded within 7 days. If your trip duration is reduced during the trip due to Unforeseen Circumstances, you may be offered a future trip on ZigZag at no cost to you, depending on the amount of time by which your original trip on ZigZag was reduced and, subject to availability. You acknowledge that “Unforseen Circumstances” includes but is not limited to the following; inclement weather, issues pertaining to ZigZag and any medical emergency, such as injury to guests or crew. You acknowledge that if you cancel your travel on ZigZag less than 24 hours before the departure date, this will result in the forfeiture by you of the full trip price. You acknowledge that travel with, and the recreational services provided by, ZigZag (such as all in water activities and bushwalking) involve risk, including in particular a risk of being stung or bitten by jellyfish and other marine creatures or native fauna. You are advised to wear a stinger suit at all times you are in the water. Whilst we make every effort to safeguard our passengers travelling on ZigZag , you acknowledge and agree that ZigZag is not liable to you for personal injury, aggravation of any existing injury or condition, mental injury, contraction of any disease, loss (direct, indirect or consequential) or death (including but not limited to from jellyfish stings) resulting from the recreational services provided by ZigZag , ZigZag hereby excludes absolutely all such liability to you. Where the Competition and Consumer Act (CCA) consumer guarantees apply you also acknowledge and agree that the liability of ZigZag for any breach of those consumer guarantees is excluded to the maximum extent possible under section 64A of the Australian Consumer Law and 139A of the CCA, where you are killed, injured (physically or mentally) or contract a disease, or an existing disease is aggravated, arising from your trip onZigZag Whitsundays . Your agreement with ZigZag Whitsundays is subject to the laws of Queensland, Australia If any of these terms is unreasonable or unenforceable for any reason whatsoever, it shall be severed and the remaining terms will not be affected in any way.